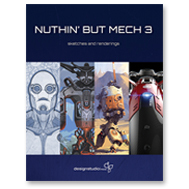 Fifty-four artists contribute to this amazing third installment of the popular Nuthin’ But Mech book series, based on the eponymous blog started by designer Lorin Wood in 2009 to create a place for his friends, colleagues, and acquaintances to share a common passion: robots. The popularity of the blog led to the publication of the first Nuthin’ But Mech book in 2012 with the work of 31 artists, followed by the highly anticipated second volume in 2014 with 40 artists. 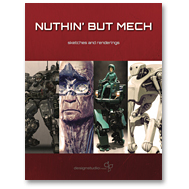 Nuthin’ But Mech 3 is the biggest volume to date, with new and returning contributors, and it is dedicated to the memory of contributing artist Francis Tsai, a remarkable talent and inspiring figure who passed away from Lou Gehrig’s disease in early 2015. In addition to featuring exceptional portraits that Tsai created using eye-tracking software, mech fans will appreciate the breadth of high-quality digital paintings, 3D models, as well as traditional works, by some of the most prominent artists and designers working in the entertainment industry today. In appreciation of Francis Tsai’s contributions to the artistic community, proceeds from the sales of this book will be donated to his family. Categories: Books, mech. Tags: aaron beck, al brady, andrée wallin, ara kermanikian, ash thorp, bastiaan koch, ben erdt, ben mauro, benjamin louis, brian hagan, chris bonura, chris rosewarne, chris stoski, colie wertz, danny gardner, darren bacon, edon guraziu, eduardo gonzalez, elijah mcneal, emmanuel shiu, eric joyner, francis tsai, gavriil klimov, gerald blaise, ian mcque, jake parker, james paick, jan urschel, johh viers, john liew, john mcinnis, josh viers, justin fields, kevin conran, kirill chepizhko, kurt kaufman, long ouyang, lorin wood, matt tkocz, miguel lopez, neil blevins, patrick hanenberger, patrick o'keefe, peter popken, robert chew, sam brown, simon stålenhag, steve talkowski, sunil pant, søren bendt, Thierry Doizon, tyruben ellingson, vaughn ling, vitaly bulgarov. It all began in 2009, when designer Lorin Wood started the Nuthin' But Mech blog to share artwork by him and his colleagues featuring their favorite subject: robots. Three years later Wood launched the eponymous book series, providing three (now four!) opportunities for dozens of talented artists from around the world to showcase their passion projects and personal visions of robots in print. 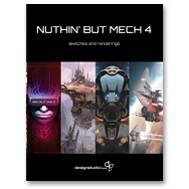 Wrapping up the undeniably popular series, Nuthin’ But Mech 4 perfectly complements the thrilling volumes that preceded it, and celebrates how far artistry and technology can advance in just a few years. This final installment features artists from all manner of industries (film, animation, video games, theme parks), and their remarkable works illustrate a vast range of tones and themes. You'll also learn about the creators themselves through their accompanying biographies, which add a personal―sometimes comedic―touch. It's fitting that with the series coming to a close, Nuthin’ But Mech 4 brings together the highest number of creatives yet―fifty-seven in all―each with original and imaginative points of view. More talent, more inspiration, more mech! Nuthin' But Mech is the brainchild of Lorin Wood of Gearbox Software. He wanted a place to harbor his passion for robots so he put together a blog and corralled some of his friends and professional acquaintances to populate this nook of cyberspace. A collaborative effort from over 40 artists, this title will showcase various styles of mecha design that the artists create while they are not working on block buster movies, tv shows and video games. 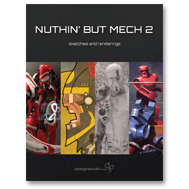 The highly anticipated follow up to best seller, Nuthin' But Mech, Nuthin' But Mech 2 delivers outstanding artwork from 40 artist contributors to the Nuthin' but Mech blogspot. Founder of the blogspot, Lorin Wood is so passionate about Mecha design that he created a nook of cyberspace to dedicate to the talent that he found among his colleagues. Currently with Gearbox, Lorin has been involved with the development of games Aliens: Colonial Marines, Borderlands as well as Borderlands 2. Prior to joining Gearbox in 2007, Lorin worked with major studios such as Walt Disney Pictures, 20th Century Fox and Warner Independent Pictures. Monday - Friday. 11am - 6pm. © Copyright 2019 Design Studio Press. Terms and Conditions.